For families looking for a luxury camping site well equipped for both relaxation and fun, La Vallée de Deauville is the perfect choice. Located near the coastal town of Trouville, beach walks and seaside gastronomy are as little as 5km away. Closer to home, La Vallée de Deauville provides everything you could want for your family getaway. La Vallée de Deauville is a coastal campsite 5 km from the beach. As a great base to explore the surrounding area, historical sites like the American cemetery, D-Day Landing beaches and military fortifications are accessible by car. 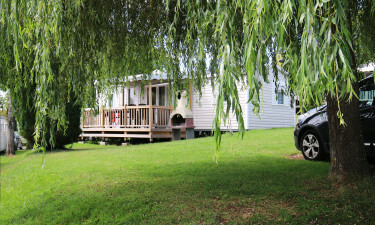 On site you can expect a relaxing camping holiday with well secluded mobile home accommodation. There are many activities to enjoy to keep the whole family entertained. For a taste of Normandy, book now through LuxCamp. Why choose La Vallée de Deauville? You can keep cool in the summer sun by taking a dip in one of the campsite's pools. An outdoor pool has a paddling area, slides, sprays, bridges and deck chairs. An indoor pool is available with a jacuzzi and water spray. You are 5km from the beach in Deauville, ideal for coastal walks. The sandy beaches are ideal for building sandcastles while the nearby promenade of Trouville-sur-Mer offers seaside treats and snacks to indulge in.